This double-sided folded pamphlet published by the American Humane Education Society (AHES) focuses specifically on Band of Mercy activities. In the centre of the pamphlet is a black and white photograph taken at a large Band of Mercy meeting in Kansas City, Missouri. 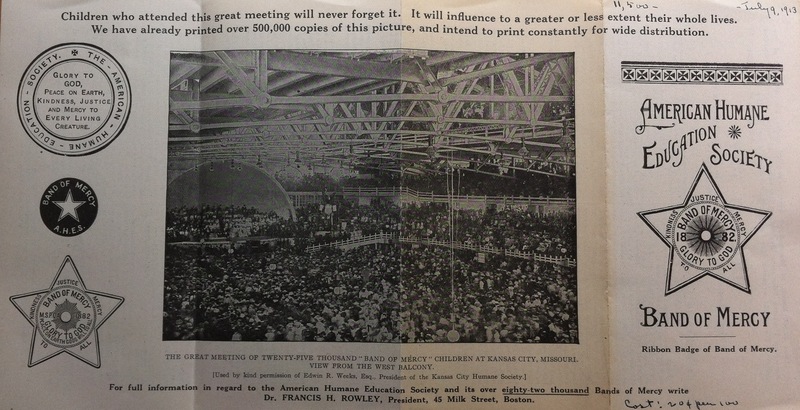 According to this pamphlet, over 25,000 children were in attendance at this meeting. American Humane Education Society Pamphlet, 1913. Collection of MSPCA Angell. The importance of visual imagery in spreading the word of Humane Education and Band of Mercy activities is underscored in the text accompanying this picture: “We have already printed over 500,000 copies of this picture, and intend to print constantly for wide distribution.” In other words, Francis Rowley, President of the AHES, recognized the power of an image like this in bringing even more children to the Band of Mercy movement. The graphic renderings of the Band of Mercy logos and buttons on either side of this photograph ensure that even those who take the most casual glances at the central photograph recognize that this crowd of children is assembled under the Band of Mercy banner.